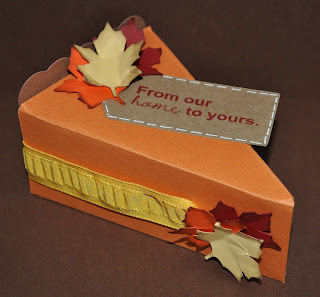 The Design Team's assignment for today's post at Craft Junkie Too is Thanksgiving. I'm so excited that Thanksgiving is fast approaching...mostly because that means I have a whole week off of work, to shop, bake, and put up my Christmas tree :). I wanted to make something along the lines of decorations or small gifts, so I made some yummy pumpkin pie. The sentiment is from My Pink Stamper's Yummy-licious stamp set. I love the pie cut and can see so many things to use it for such as placemarkers ect. Which cartridge do you use? Thanks for sharing!!!! This is soooo cute! There's a cake/pie box on the Tie the Knot cartridge and I've been dying to try it! Thanks for the inspiration! Love the leaves! This is a great idea for Thanksgiving dinner, as place cards or favor boxes to go home. They would be perfect to make, fill with a piece of pie and hand out to neighbors, co-workers, or even a senior center! ;) Thanks for sharing! Love these boxes...so ready for pumpkin pie. Great box, I love the leaves you added to top it off! !